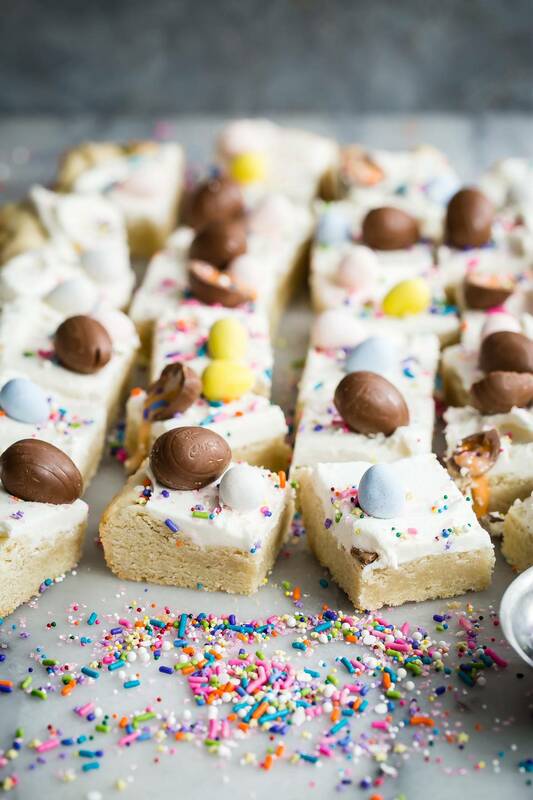 If you love sugar cookies, it stands to reason that you’ll love these sprinkle-laden sugar cookie bars! I’ve been making so many salads lately, it felt like I had to change things up a bit. So from one end of the healthy spectrum to the other, I made these awesome sugar cookie bars. They’re a spin on the old school soft baked cookies you can find at most regular grocery stores, the kind that melt in your mouth and make you crave ten more! But because I love making things in squares, I had to make a version of these and once you make them you’ll see why I became so obsessed. 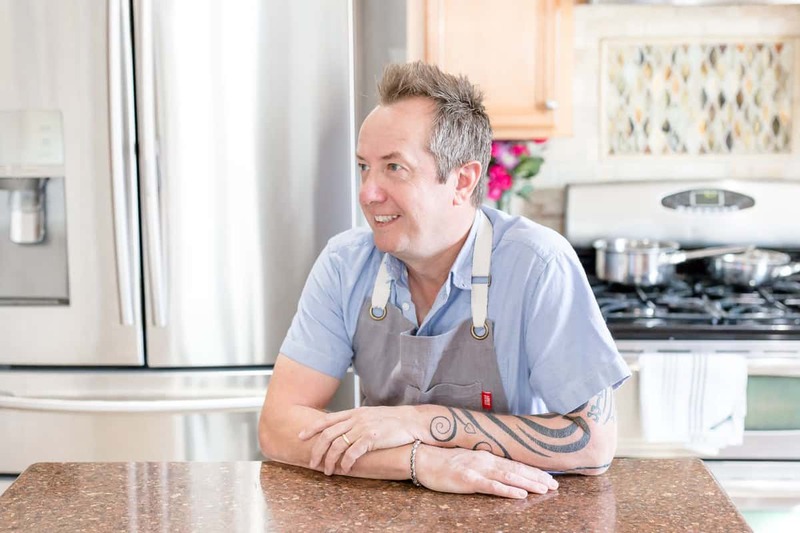 The cookie part is soft and chewy with a good healthy taste of vanilla, adding lemon or any type of citrus zest would taste great too but straight up sugar cookies with good vanilla is hard to beat. 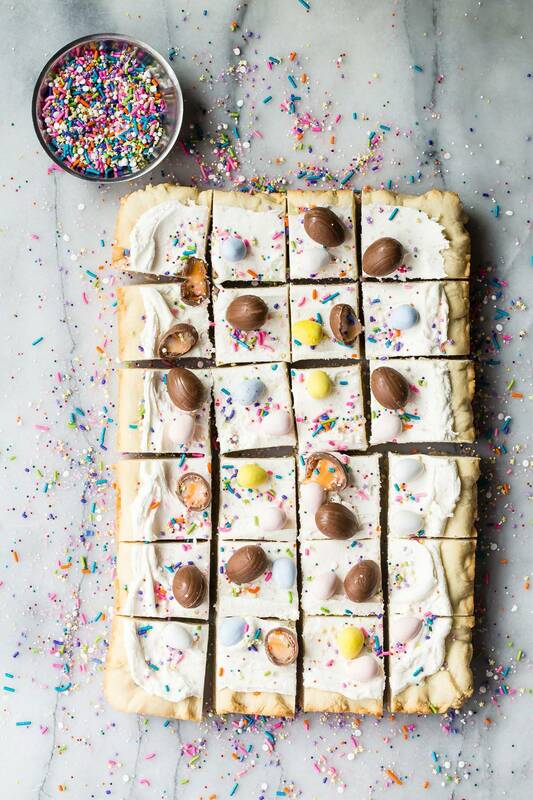 What’s in these sugar cookie bars? They’re very simple. Butter (lots), sugar (of course) flour, vanilla, baking powder and egg. The frosting is even simpler with only powdered sugar, milk and butter. It’s not one of those gritty sugar frostings either, it’s smooth and creamy and actually not too sweet. Do’s and don’ts of making sugar cookie bars. Do make sure your butter is soft. Do use a stand mixer. 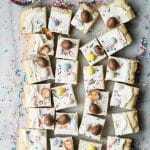 Do line your baking pan with parchment paper. Don’t over mix the dough. Don’t over bake the sugar cookie bars. Don’t forget to let the sugar cookie bars cool before frosting them. How do I store my cookie bars? The best way to store them is at room temperature. As soon as you put them in the refrigerator the cookie will start to dry out and the frosting will become hard due to the butter content it has in it. Let’s be honest, these are not going to last very long, maybe two days at the most. Buttercream is always best served at room temperature and you’d never think about keeping your fresh baked cookies chilled so don’t do it with your cookie bars either!. Can I use different decorations for the topping? You definitely can. My post is for Easter but you could use any topping for any celebration throughout the year. These would be great to take to a birthday party just with sprinkles, they won’t last long! Check out these other sugar cookie recipes you might love! These amazing sugar cookie bars are just like the store bought sugar cookies everyone loves but in a bar! These are decorated for Easter but you can do any style you like! Using a stand mixer, beat the butter and sugar until creamy. Scrape the sides of the bowl down and add the vanilla and eggs making sure they are well mixed. Slowly add the flour mixture on low speed and mix until a dough forms. 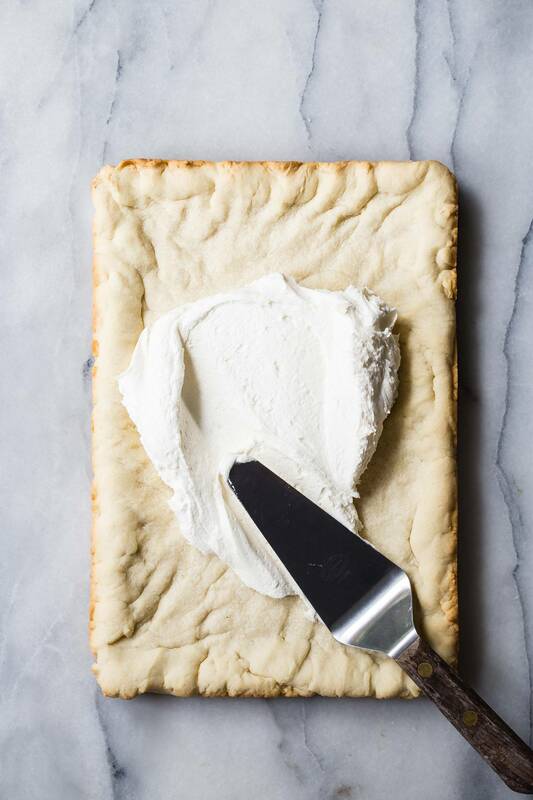 Dump the dough unto your prepared baking pan and press it out to fit the pan making sure it's even. Bake int the oven for 20 minutes and then let cool. To make the frosting add the powdered sugar, butter, vanilla and milk to the mixing bowl again. Use a whisk on low speed until all of the ingredients are incorporated and then switch to high speed until light and creamy. Make sure to scrape the sides of the bowl a few times with a spatula. Carefully lift the sugar cookie bars from the pan and set down on a wooden board. 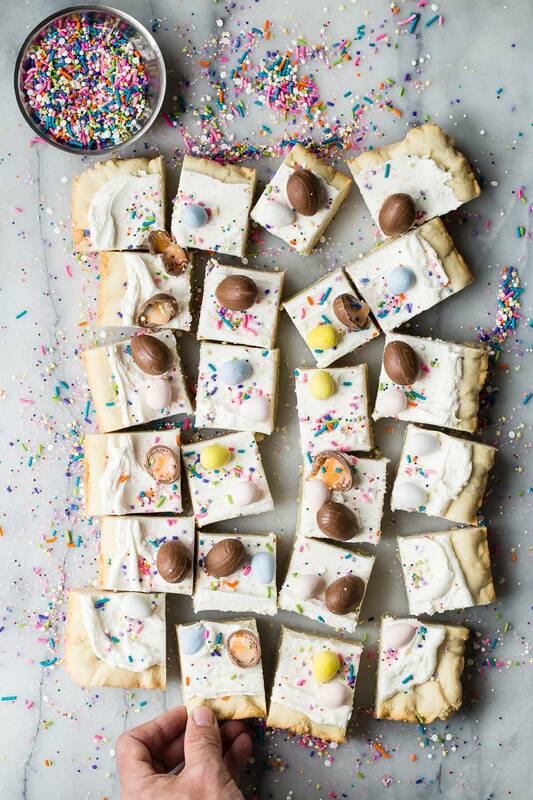 Spread the frosting on top of the sugar cookie bars and decorate with the sprinkles, candy eggs and chocolate creme eggs. Slice into small squares and serve.